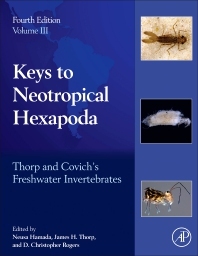 Thorp and Covich’s Freshwater Invertebrates, Fourth Edition: Keys to Neotropical Hexapoda, Volume Three, provides a guide for identifying and evaluating a key subphylum, hexapoda, for Central America, South America and the Antarctic. This book is essential for anyone working in water quality management, conservation, ecology or related fields in this region, and is developed to be the most modern and consistent set of taxonomic keys available. It is part of a series that is designed to provide a highly comprehensive, current set of keys for a given bioregion, with all keys written in a consistent style. This series can be used for a full spectrum of interested readers, from students, to university professors and government agencies. Is a research scientist in Brazil with almost 30 years of experience. Neusa has been at Coordenação de Pesquisas em Entomologia (CPEN) since 1989. In the past 10 years 90 journal articles, 3 books local to the Brazilian market have published and Neusa has contributed an additional 21 chapters to a variety of titles. Dr. James H. Thorp has been a Professor in the Department of Ecology and Evolutionary Biology at the University of Kansas (Lawrence, KS, USA) and a Senior Scientist in the Kansas Biological Survey since 2001. Prior to returning to his alma mater, Prof. Thorp was a Distinguished Professor and Dean at Clarkson University, Department Chair and Professor at the University of Louisville, Associate Professor and Director of the Calder Ecology Center of Fordham University, Visiting Associate Professor at Cornell, and Research Ecologist at the University of Georgia’s Savannah River Ecology Laboratory. He received his Baccalaureate from the University of Kansas (KU) and both Masters and Ph.D. degrees from North Carolina State. Those degrees focused on zoology, ecology, and marine biology, with an emphasis on the ecology of freshwater and marine invertebrates. Dr. Thorp is currently on the editorial board of two journals (River Research and Applications and River Systems) and is a former President of the International Society for River Science. He teaches freshwater, marine, and general ecological courses at KU, and his Masters and doctoral graduate students work on various aspects of the ecology of organisms, communities, and ecosystems in rivers, reservoirs, and wetlands. Prof. Thorp’s research interests and background are highly diverse and span the gamut from organismal biology to community, ecosystem, and macrosystem ecology. He works on both fundamental and applied research topics using descriptive, experimental, and modeling approaches in the field and lab. While his research emphasizes aquatic invertebrates, he also studies fish ecology, especially as related to food webs. He has published more than one hundred refereed journal articles, books, and chapters, including three single-volume editions of Ecology and Classification of North American Freshwater Invertebrates (edited by J.H. Thorp and A.P. Covich) and the first volume (Ecology and General Biology) in the current fourth edition.